FIG. 1—MICHAEL E. HOROWITZ, INSPECTOR GENERAL OF THE U.S. JUSTICE DEPARTMENT, promised the American people in his Confirmation Hearing that he would tell the truth and avoid even the appearance of impropriety in a sworn statement. (DEC. 17, 2017)—On Dec. 13, 2017, Rod Rosenstein, Deputy Attorney General, testified before the House Judiciary Committee about the evident conflicts of interest within the DOJ/FBI’s Trump-Russia investigation. His body language betrayed him. He is very evidently a subordinate covering for his real boss Special Counsel Robert Mueller, not Jeff Sessions and Donald Trump. Rosenstein not so deftly refused to answer most questions. FIG. 2: ROD J. ROSENSTEIN, DEPUTY ATTORNEY GENERAL, testified to the House Judiciary Committee on Dec. 13, 2017 about the evident FBI / DOJ conflicts of interest in the alleged Trump-Russia election interference investigation. This investigation has dragged on for seven months and has produced no evidence of Trump Russian collusion. Fusion GPS, the Democratic political opposition research firm, was recently exposed as the source of the fabricated “dirty dossier.” James B. Comey’s FBI used the fraudulent dossier to get a secret FISA Court authorization to wiretap the Trump campaign. Then, Comey admitted to Congress that he first showed President Trump a summary, then immediately leaked the bogus document to The New York Times with the specific objective of triggering a Special Counsel investigation to embarrass the President. New information shows that senior FBI officials under Comey ordered the dossier from Fusion GPS to help prevent Donald Trump from being elected President. Rosenstein fidgeted with his notes, looked away, looked down, nervously laughed, smirked, glared, peered at the questioner from the corners of his eyes. Psychology experts say these are classic body language signals of deception. See for yourself: C-Span Video. FIG. 3: REP. JIM JORDAN (OH-4TH) BLISTERED ROD J. ROSENSTEIN, ASSISTANT ATTORNEY GENERAL, for his uncooperative and evidently deceptive testimony before the House Judiciary Committee on Dec. 13, 2017. Before the hearing, DOJ Inspector General Michael E. Horowitz had leaked 375 salacious, anti-Trump texts between FBI chief of counterintelligence Peter P. Strzok and his lover Lisa Page, herself an FBI attorney in the Office of General Counsel. The official line from Mueller’s office was that following the revelation of these anti-Trump texts, Mueller removed Strzok from the investigation, reassigned him to human resources, and sent Page packing to the Securities and Exchange Commission. Political observers don’t believe Mueller’s stated reason since it is well known that all, or practically all, of Mueller’s team were anti-Trump. If he used that logic consistently for all his employees, he’d fire most of his staff. So, that cannot be the real reason. National security experts are equally skeptical. They say such revelations of fraternization among FBI officials are by themselves grounds for immediate revocation of security clearances and dismissal, not simply reassignment and a slap on the wrist. Remarkably, one of Horowitz’s letters of recommendation in his confirmation was from David W. Ogden (24.1 MB), Assistant Attorney General. Ogden was also a close DOJ colleague to Robert S. Mueller, James B. Comey, Eric J. Holder, Jr., James P. Chandler, III,, Rod J. Rosenstein and Andrew Weismann. LETTER OF RECOMMENDATION FOR MICHAEL E. HOROWITZ CONFIRMATION (PAGES 139-140, 24.1 MB) INVOLVING MUELLER STOOGES, includes DOJ insiders implicated in many elements of the Deep State shadow government corruption. Horowitz’s association with David W. Ogden proves he knows Peter Strzok and Lisa Page should be FIRED IMMEDIATELY for their affair. Horowitz’s association with Donald K. Stern proves a direct connection between the Justice Department and its obstruction of justice with Hillary Clinton and the State Department in Leader v. Facebook.—the theft of Leader’s social networking invention. The courts protected Facebook even after Leader proved that Facebook infringements Leader’s patent on 11 of 11 claims. Ogden argued successfully for the firing of Marine employee Michael J. Brown who was fired for an affair with a Marine major’s wife. This case did not even involve top secret clearances. Brown v. Department of the Navy, 229 F. 3d 1356 (Fed. Dir., 2000). So why haven’t Strozok and Page been fired?! In short, Mueller’s softball treatment telegraphs that the real purpose for the leak appears to be to protect Strzok and Page. Experts are certain that Mueller is responding lawlessly to the leak and revelations of an affair among senior FBI officials. Andrew Weissmann’s fraudulent Enron accounting scandal activity. FIG. 4: PETER P. STRZOK, the demoted former chief of FBI counterintelligence hated Donald Trump. He used his powerful position at the FBI to punish Trump supports and cover-up the illegal activities of Hillary, Podesta and Soros backers. Based on the investigation described in this post, Strzok is an evident agent of the Deep Shadow government that is attempting to take over the American Republic. Despite Strzok’s seething political bias, Mueller assigned him to the Trump-Russia election meddling investigation. Mueller is either an idiot himself, or calculating, and we don’t think he’s an idiot. Later, Strzok edited James Comey’s Hillary Clinton exoneration letter from “gross negligence” (illegal) to “extreme carelessness” (not even a legal term). Tellingly, Rosenstein seemed to explain away Strzok’s conduct by voicing the excuse that FBI agents are allowed their personal political opinions, and are professional enough to keep them separate from their work. If you believe that personal political opinions don’t affect professional actions in this case, then you are the idiots, Messrs. Rosenstein and Strzok. Evidently, you picked each other to run this investigation, out of all the tens of thousands of capable attorneys. Your biases drove your decisions! Any reasonable person can see that clearly. Rosenstein’s answer about private political opinions was too quick and rehearsed to be credible. At this stage, he and his cronies have lied so often that we are all wise to them now. Strzok said: “Just went to a southern Virginia Walmart. I could SMELL the Trump support…” By contrast, their stench wraps the planet. For readers unfamiliar with texting shorthand ” 😉 ” is a wink and a smile. THERE WE HAVE IT: AN ADMISSION OF THE TREASONOUS ACTIONS OF THE AMERICAN SURVEILLANCE STATE. Strzok has used his position of public trust to attempt to control American politics and reinforce his job as the chief of counter espionage. Here we have the FBI’s counter espionage chief admitting that the FBI’s “Espionage Machine Party” is the only real power in America. “Espionage Machine Parties” in history had names like The Third Reich, the Soviet Communist Party, The Maoist Party. We have just learned that our long-time FBI Chief of Counterterrorism, Peter Strzok, has been working with Mueller, Rosenstein, Chandler, Comey, Holder, Obama and many others to establish America’s secret espionage machine as the controlling political party. We also learned that they loath average Americans along with our President. Rosenstein deferred repeatedly to a coming January 2018 report from the DOJ Inspector General. Tellingly, Rosenstein emphasized that Horowitz had a $100 million budget, telegraphing that the report would be massive, full of redactions and unintelligible to the smelly Deplorables at Wal-Mart. AFI corruption researchers have observed that the more pages a government “finding” generates, the more corrupt the agency. Like Rosenstein’s betrayed body language, his deference to all-things-Horowitz telegraphed that they are going to dump a whopper of meaningless nonsense. We’ve got your numbers boys and girls. Michael Horowitz’s own Senate Confirmation Hearing statement itself proves he’s Deep State shadow government stooge. Click here for Horowitz’s Senate Confirmation Hearing biography. Senior judiciary nominees often testify to the Senate Judiciary Committee prior to their confirmation. Confirmation is generally a given, but not universally. Prior to a confirmation hearing, the nominee must prepare a “Statement” where he or she answers specific questions about their background. They must describe in great detail their past employment, key accomplishments, significant events, publications, speeches, memberships, trusteeships, directorships, articles, media appearances, financial disclosure and significant relationships. The Statement rules require nominees to certify that they will be ethical and avoid even the appearance of impropriety in their work for We the People. Horowitz certified his commitment to be ethical his Statement, albeit in a backhanded way that is typical of these Deep State slime ball attorneys. He says he consults with unnamed others. He references an ethics agreement not submitted to the Senate (and can therefore be changed at any time since it does not go into the Senate record). He says he will follow the recommendations of unnamed other ethics people. Again, who can check? THIS IS OUTRAGEOUSLY DECEPTIVE CONDUCT FROM THE VERY DOJ GUY WHO SPENT TEN YEARS ROAMING THE PLANET SPEAKING ON ETHICS AND COMPLIANCE! HOROWITZ PROMISED TO BE ETHICAL. HE LIED. FIG. 6: S. Hrg.112-72, Pt. 5. (Oct. 19, 2011). Ethics Statement & Certification, Confirmation Hearing for Michael E. Horowitz, Nominee to be Inspector General, Department of Justice. 112th Congress, Serial No. J-112-4, PDF p. 58.Government Printing Office. Horowitz is a George Soros cut out—groomed at Harvard Law where Massachusetts Rep. Barney Frank (D) and law professor James P. Chandler, III were his handlers. Horowitz traveled and worked the following countries during his speaking tours: Russia (2004, Oct.), Moscow, Russia (1998, Jul.) Beijing, China (1999, Sep.), Bangkok, Thailand (2002, Mar. ), Capetown, South Africa (2000, Sep.), Sydney, Australia (2001, Sep.). Horowitz changed law firms like clothing—6 law firms in 17 years, not counting his 9 different positions within the Department of Justice. He changed jobs about every 18 months! These sorts of too-good-to-be true resumes almost always telegraph a person who is being groomed by the powers that direct him or her. For almost a decade Horowitz engaged in a break-neck speaking schedule around the planet. Ostensibly as a private citizen, he trained judges and lawyers on the subjects of sentencing guidelines, compliance, ethics, Sarbanes-Oxley and liability avoidance. He did this all the while Bill Clinton roamed the planet raising money for The Clinton Foundation and using Secretary of State Hillary and Obama’s State Department for pay-to-play. FIG. 8: BILL J. CLINTON AND MICHAEL E. HOROWITZ roamed the world giving political and legal speeches, polenating political and legal corruption around the planet in preparation for the Deep State shadow government to takeover the American Republic. On Jan. 29, 2011, Rep. Barney Frank was captured on video at the World Economic Forum (Davos) kibitzing with George Soros and Bono—two known New World Order globalists. Exactly six months later, on Jul. 29, 2011, Obama nominated Horowitz to be DOJ Inspector General. Qualcomm (the primary wireless technology provider that embeds Deep State encryption NSA/C.I.A. backdoors) was a member of Barack Obama’s “Technology CEO Council,” and Obama made a special secret visit to Qualcomm in San Diego in Air Force One on Oct. 9, 2017. Fig. 9: On Mar. 02, 2015, President Obama and senior adviser, Valerie Jarrett, met with chief beneficiaries of the stolen Eclipse Foundation code:IBM, Xerox, Dell, Micron Technology, Qualcomm and EMC. Given the timing of this meeting―a week after the radical “Net Neutrality” changes to Internet regulation by the FCC—the real agenda of this group was most likely to discuss progress on their common agenda—the IBM et al “The Internet of Things” takeover of global digital infrastructure, which the FCC changes to Internet regulation helped facilitate. NOTE ABOUT THE ABOVE PICTURE: THIS IS THE PICTURE OF THE MARCH 2, 2015 MEETING AT THE WHITE HOUSE. THE OCTOBER 9 MEETING OCCURRED IN A DIFFERENT LOCATION. .
Microsoft began sharing personally identifiable user data on Americans to the NSA on Jun. 6, 2013. 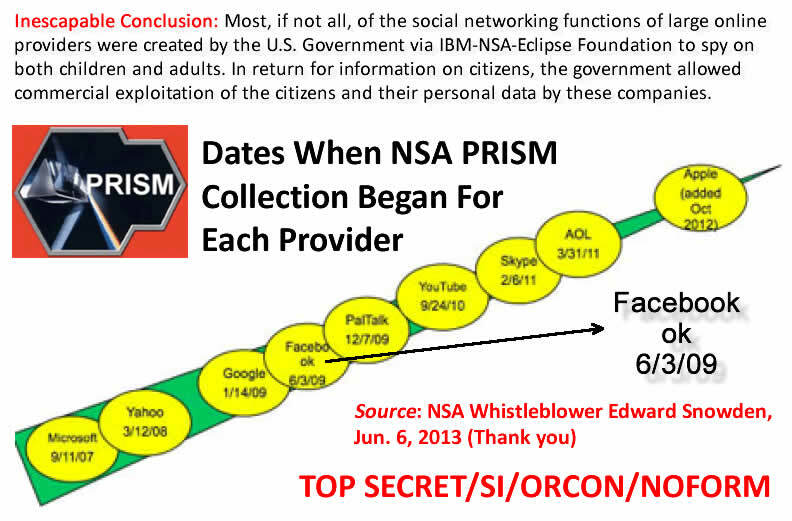 See whistleblower Edward Snowden NSA slide. Horowitz’s Cadwalader Law other clients including Bank of America, Barclays, Deutsche Bank, JP Morgan Chase and Morgan Stanley were primary underwriters and beneficiaries of the fraudulent Facebook initial public offering on May 18, 2012, among others. Horowitz declared his net worth at almost $10 million in 2011. Genius or insider trading. See earlier links for Horowitz’ Senate Confirmation Hearing testimony. Horowitz cannot even remotely claim to be impartial in the Trump-Russia investigation. Horowitz owes his legal career to George Soros, Bill & Hillary Clinton, The Clinton Foundation, Robert Mueller, Rod Rosenstein, James Chandler, James Comey, Preetinder Bharara and the usual cast of suspects attempting this coup against President Donald Trump. Michael Horowitz must recuse himself or be fired forthwith from further work on the Trump-Russia investigation. His fraudulent manipulation of the rules by releasing the Strzok-Page texts insured that those two could not be prosecuted for that evidence since any trial would be tainted by Horowitz’s own hand. He protected them, which he will continue to do for all his cronies. Michael Horowitz himself must be investigated for his failure to disclose his massive conflicts of interest with the Clinton et al camp, among other things. And as we continue to remind all of our readers in our articles exposing the massive corruption in Washington, We the People hold a huge TRUMP CARD in totally destroying the cabal from the D.C. Swamp to the spies of Silicon Valley. Ask President Trump to fund the alternative media via Leader Technologies’ Miller Act Notice. This would generate $300-500 billion per year in new revenue for the government without raising taxes, so investigations like this can start holding these corrupt public officials accountable in real time—rather than years after their crimes have done their serious damage to our Republic.